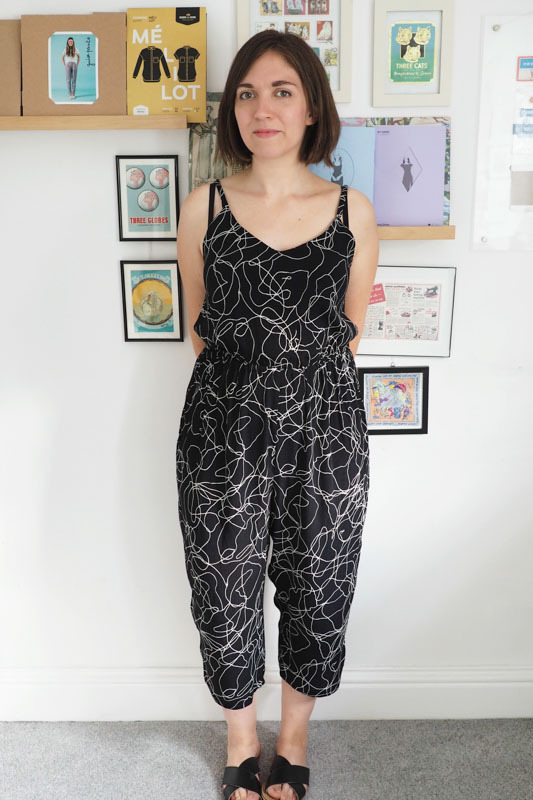 I am loving your summer of the jumpsuit! Perfect for looking cool in hot weather. I really like this fabric, too, glad you could make it work! And really nice of The Fabric Store to help you out. Good to hear! Yup, 10/10 for their customer service! Cute indeed. Gotta separate those colours in the wash tho! I’ve got a black merino-silk top that still bleeds after 5 washes! eep – I’m going to put this in my darks wash in the future, but the most annoying part was it bleeding over *itself* – no way around that one! Katie, you have an incredible eye for prints. My fabric pinterest board is basically populated just with your fabric picks reposted ;-) This one is another winner — what an amazing simple print! 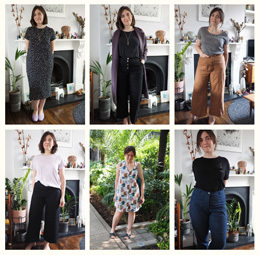 It has to be said, too, that you’ve built a great summer wardrobe. Ha, thank you! I love this print a lot! 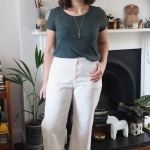 Lovely jumpsuit, love the cami top agree on getting fit spot on is not easy but it looks great, shame about the fabric but it’s always good to know what their customer services are like. I know what I need to fix on the fitting, so hopefully it will be better next time! Agree, I would be happy to order from them again but definitely be 100% careful in separating the fabrics. Oh this print!!! It’s a perfect choice for your jumpsuit. It was worth the trouble, it looks great on you! How great Fabric Store were to sort you out with some new fabric. 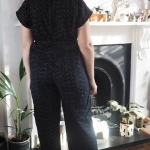 I love this jumpsuit and really like the changes you’ve made to the pattern – it really did need to sit snuggly at the top. I wasn’t sure, but I’m guessing that the pattern originally had full length trouser legs. 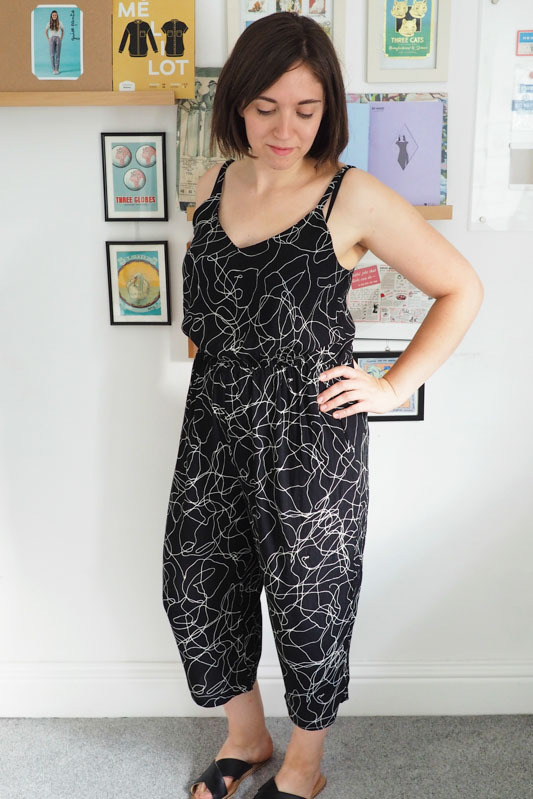 I do like the length you’ve chosen for your jumpsuit – far more summery. oh this is nice. it’s still spring(rainy season) now here in my country, so I guess I’d have to shelf this up for when the heat returns. It’s truly lovely. any tutorial on how you made it? This looks super cute! 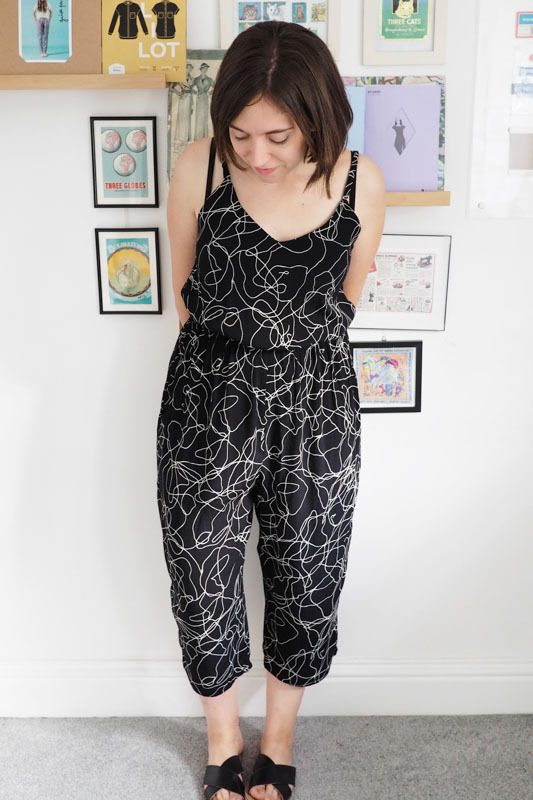 I’m loving following along with your summer of jumpsuits. I would have cried my eyes out over your washing mishap. How awful! I’m glad you were able to salvage the rayon and kudos to the Fabric Store for helping you out with the others. Cute, and yes you definitely have great taste in fabric prints. Just wondering, did the pattern have any final garment measurements? If so, were they just incorrect? 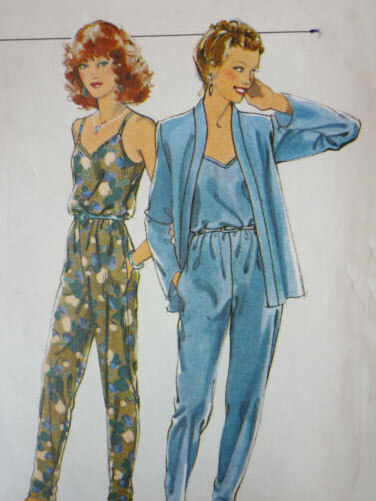 I used to sew a lot of late 80s Style and New Look patterns and looking back the finished items were probably looser than I would have liked, but I was a young sewist and didn’t think much of it at the time and just trusted the body measurements to fit me. Thanks. No, it just had back waist length (which always seems spectacularly non-useful!). I think it just had far too much ease; also that I’m smallest around the upper bust so I should have graded down anyway.